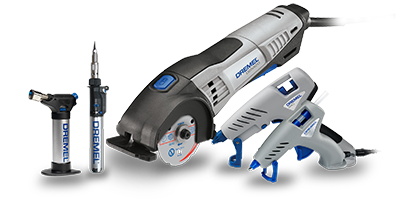 The Dremel 940 is a high temperature (195 °C) glue gun with a drip-controlled exchangeable tip. With its removable cord the 940 can be used at any place without available power. Because of its good ergonomics (on/off switch, T-handle, stable base, extendable kickstand) and replaceable tip it is ideal for light DIY jobs around the house and outdoors, such as repairing furniture, gluing wood, ceramics, etc.